When Jesus called Matthew, as he sat in his office where he collected customs duty, Matthew rose up and followed him and left everything behind him except one thing - his pen. Matthew was to become the great chronicler of Christ's life and teachings - and, though it is widely accepted that he did not write the gospel itself, his influence is undeniably felt throughout. Matthew has a rhythmical and often poetical prose. Of the synoptics, it is the gospel best suited for public reading, and is probably the best known as a result: it includes Christ's infancy, the Sermon on the Mount, the well-known parables, the Resurrection and many other familiar stories. William Barclay helps us to rediscover the immediacy and freshness of this familiar gospel. 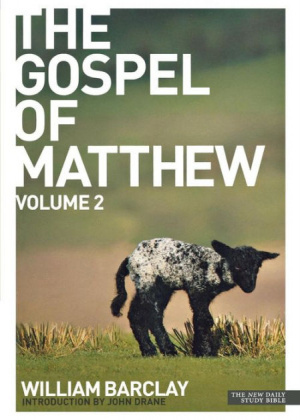 The Gospel of Matthew by William Barclay was published by St Andrew Press in October 2009 and is our 6076th best seller. The ISBN for The Gospel of Matthew is 9780715208915. Be the first to review The Gospel of Matthew! Got a question? No problem! Just click here to ask us about The Gospel of Matthew. Just wondering why there are two parts? A:William Barclay produced two volumes on the Gospel of Matthew; each volume covers roughly half of this particular book of the Bible.